Relax and enjoy some sun & sea at the best beaches in Tenerife. The island of Tenerife has some precious beaches along its extension that will amaze you, for sure. Tenerife is one of the islands that holds more tourists throughout the year. A good explanation for it is the fact that all of its beaches are well taken care of, clean and with many facilities available. Moreover, its sunny weather, and warm waters offer you the perfect conditions for bathing at any time of the year. The most famous beaches in Tenerife are the ones located on the south of the island in the municipalities of Arona and Costa Adeje. Tenerife has many grey, dark and golden sandy beaches allowing you to find the perfect beach for you. Many nudist beaches are also located on this island. Description: This is a set of busy beaches with many movement and also services and facilities. Description: This is one of the most important beaches in the South of Tenerife. This beach was awarded with Blue Flag for the excellent condition of its waters. Description: Precious grey sandy beach and quiet waters. Description: This is a must-visit beach throughout the year. Nearby you’ll find many entertaining areas. 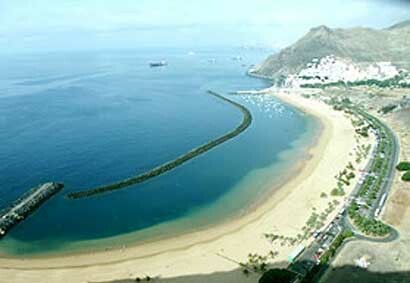 Description: This is one of the biggest and best environment beaches on the South of Tenerife. Description: An excellent beach to practice water sports. Description: This is one of the biggest and most precious beaches of this island. It has shallow crystal clear waters. Description: It’s a fine dark sandy beach located in the touristic complex of Acantilado de los Gigantes. Description: Precious black sandy beach with crystal clear waters. Description: One of the most beautiful beaches in the Canary Islands. Description: This is one of the most famous dark sandy beaches on the north of Tenerife. Description: Dark volcanic sandy beach. Even though its access is only done by foot, this is a crowded beach. Description: Precious, with fine dark sand, located to Puerto Santiago. Description: This beach was designed by the artist César Marique. It has one kilometer long which units it with the Lagos Martiánez.